Pull over to the side of the road and consider the world-ending event taking place before your eyes. The installation is the work of acclaimed artist and environmentalist Justin Brice Guariglia, who in 2016 became the first artist to go airborne on an Earth science mission with NASA when he flew over Greenland to photograph melting polar ice caps. Guariglia set up the message board Monday along the pier’s main walkway, where tourists stopped or slowed to read the rotating messages, including “Warning High CO2,” “Goodbye Arctic Ice” and Guariglia’s favorite, “Triassic Weather Ahead.” The latter refers to the geologic period marked by mass extinction that wiped out half of all marine life on Earth. Guariglia’s installation, called “We Are the Asteroid II,” is one of three pieces of public art that will be on display during Expo Chicago, the international contemporary art exposition that kicks off Sept. 27 at Navy Pier. The idea for the piece came to Guariglia when he saw a highway message board flashing an alert for motorists. “When you’re going down the highway, you’ll see these big signs flashing on the side of the road, and they warn you,” Guariglia said. “They’re supposed to get you thinking about what’s ahead. For his piece, Guariglia obtained a used LED highway message board and sandblasted it to remove all paint and debris. He then oxidized the screen’s surface to give it the sheen of a rusted asteroid, he said. The board, which measures 5 feet by 10 feet, is entirely solar-powered and can be rotated to face in a direction where most visitors will see it. The texts for the piece were commissioned by Guariglia from Rice University professor Timothy Morton, whose work combines metaphysics with ecology and who is considered one of the world’s leading philosophers. With the piece, Guariglia said he hopes to get people to think about the impact of climate change on a larger scale. 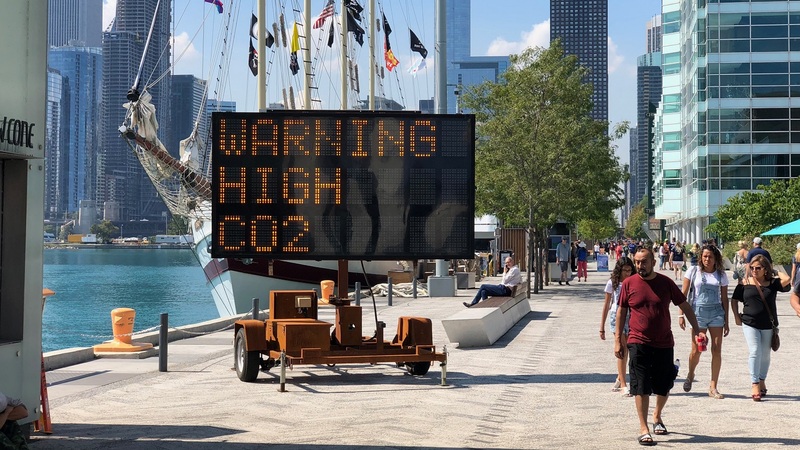 Guariglia was one of six artists to receive a $10,000 grant from the advocacy group The Union of Concerned Scientists as part of its “Art for Science Rising” initiative, which funds public art projects that highlight the importance of science in protecting public health and safety. The program is part a larger movement known as "Science Rising," which aims to push elected officials to use science in their decision-making and to address issues such as climate change. Last week, Guariglia debuted 10 similar highway message board signs throughout New York City. “We Are the Asteroid II” is on display through Nov. 30.